Maria has been part of the TSO Spring team since January 2018. 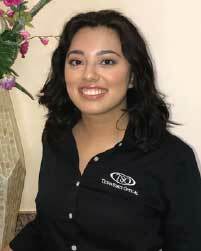 As a certified paraoptometric and certified medical assistant, Maria brings a wealth of clinic knowledge and experience. She is passionate about the rapport and relationships she builds with her patients. In the optical , Maria loves frame styling patients to help them look their best.! Outside our practice, Maria enjoys spending quality time with her family.